In the park that was a block away from my culinary school, there were a whole bunch of food trucks that I would always go check out for a snack before class. Battling my way for almost two hours into the city on the NJ Transit train always worked up my appetite, ha! My favorite snack quickly became the beef empanadas from one of the trucks, I was hooked. I had empanadas at Mexican chain restaurants before, but the ones I got from the truck were a whole new level. So, I decided to make my own beef empanadas to see if I could recapture that delicious snack from school! The yummy dough for the beef empanadas was simple to make right in my food processor. It did all of the work for me really. The key was to chill it and let it rest once I made it. That made the dough easier to work with and allowed the gluten to relax for a more tender empanada crust. While the dough rested, I made the hearty, savory filling. It was easy to make with lots of peppers, spices and aromatics. 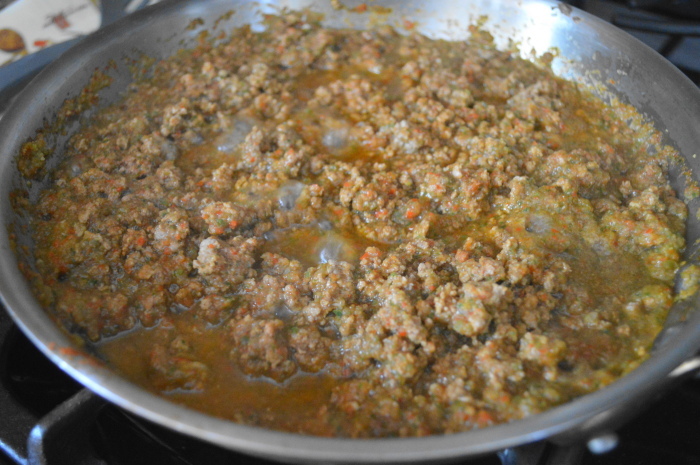 Once everything was in the skillet, the beef empanada filling simmered away to develop huge flavor. 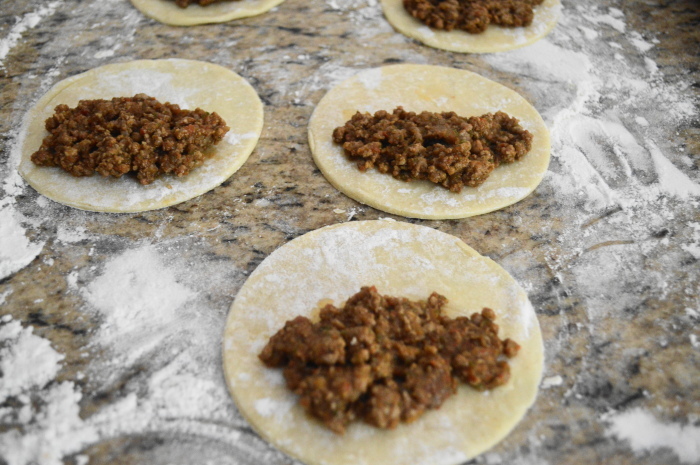 Then it was time to assemble the beef empanadas! I rolled out the dough and cut it into rounds before I scooped a small heap of filling on one side. I brought the other half of dough over to enclose the filling and seal it in. It was lucky that I had a handy empanada fork in my arsenal to do the sealing for me. 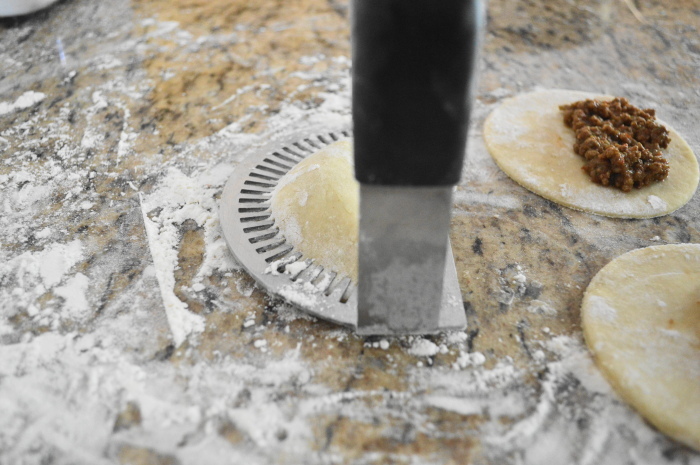 Using the empanada fork to seal the beef empanadas was such a huge time saver. First, make the dough. In the bowl of a food processor combine the flour, sugar, salt and cumin. Pulse it a few times to sift it together. Add in the water, white vinegar and egg and give it another few pulses until it resembles wet sand. Then add in the butter and keep pulsing just until a ball of dough is formed. Wrap it in plastic and let it rest in the refrigerator for an hour. Wash out the food processor bowl and blade to start the filling while the dough rests. Combine the onion, poblano pepper, bell pepper, garlic and cilantro in the food processor bowl and run it until it is a pureed mixture. Transfer the puree into a large skillet and heat it up over medium high heat. Let it bubble and get fragrant for 2-3 minutes. Add the beef into the pan. Let it absorb that puree while it cooks and you break it up with a spoon. Season it with the adobo seasoning, salt, chili powder, smoked paprika and crushed red pepper. Then add in the tomato paste and give the mixture a big stir. Let it simmer for 15 minutes over low heat. When it's done, take it off the heat and set it aside until the dough is ready. 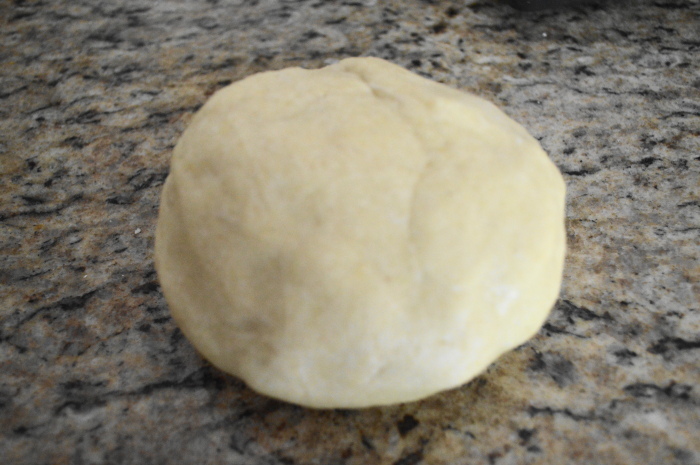 Once the dough is ready, take it out and get it onto a well floured surface. With a floured rolling pin, roll it out to be about 1/16 of an inch thick. Use a 4 1/4 inch round cutter to cut out perfect rounds as close together as possible. Take the scraps and gently bring it together into a ball and roll it out again to cut out more. Then you should be able to squeeze out 2 more rounds from the remaining scraps. Scoop a tablespoon of the beef filling onto one half of all of the rounds you cut out, then bring the other half over and pinch the ends together. To further seal them, use a fork to gently press down and make pretty marks along the edge. Heat up about 4 inches of vegetable oil in a pot over medium high heat. Using a deep fry thermometer to monitor it, keep the oil heat at 320F. When the oil is hot enough, fry the beef empanadas in batches for about 3-4 minutes until they are perfectly golden. Transfer them with a slotted spoon to a plate lined with paper towel to drain them. 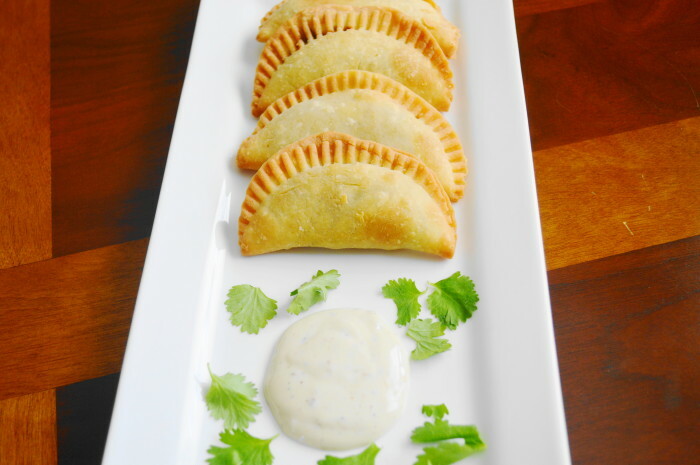 When they are all done, serve the empanadas immediately with your choice of dipping sauce!